The plot of '71 is very simple. A British squaddie gets sent to Belfast to keep the peace between Catholics and Protestants; after a riot he gets lost in a nightmarish gothic city of shifting allegiances and unknown streets, unsure of whom to trust and unable to grasp who is a friend and who is an enemy. The film is a modern take on the old Carol Reed classic Odd Man Out, which if you'll recall was about James Mason's attempt to escape through an Expressionist 1940s Belfast in the wake of a failed robbery. Not quite as good as The Third Man, Odd Man Out is still a terrific movie with some great performances, deep shadows and dodgy accents. (If you're interested I've written the introduction for the new edition of Odd Man Out by F L Green just published last month by Valancourt). 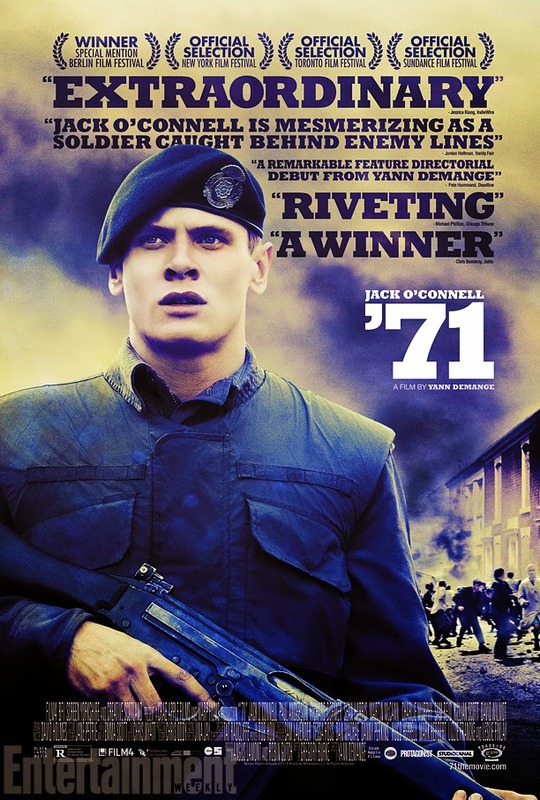 What I like about '71 is its relative sophistication regarding the Troubles. We don't get good guys and bad guys, we get shades of grey. The Official IRA versus the Provisional IRA, the various Protestant paramilitaries, the army versus British Intelligence - on all sides there are good and bad people in extraordinary circumstances. I also like the film's look - not since Resurrection Man (based on a great Eoin McNamee novel) has a film captured Belfast's 1970's scariness. This is a thriller which at times has a real horror movie feel: cobbled streets, blind alleys, and a strange menacing stalking presence as the Provos come for the soldier. I also liked the acting which I thought was naturalistic and underplayed and good. But '71 is by no means perfect. First of all it was NOT FILMED IN BELFAST. The new Dracula movie was filmed in Belfast, Game of Thrones is filmed in Belfast, they're making Goddamn zombie movies in Belfast but '71 was filmed in Blackburn, Lancashire. I've been to Blackburn and it looks nothing like Belfast. Filming '71 in Blackburn is as bad as filming Rumble in the Bronx in Vancouver. My second problem with the movie was its portrayal of the policemen. Why are the RUC policemen always either sinister or stupid in every Troubles movie? I knew about twenty cops in the RUC and not one of them was evil. A couple were very stupid indeed but none of them was actually evil. (Well except for one dude who pulled his revolver out at a party, emptied out five of the shells, spun the chamber, pointed the gun at me (because I was yelling at him to put the piece away) pulled the trigger and then put the revolver against his own temple and pulled the trigger again.) Thirdly....ok there is no thirdly. As I've written this I've talked myself out of disliking the movie quite as much as I did when I started this blog post. I'm glad '71 exists. The British critics have embraced the film, the Irish critics like it and it's going to expand minds in America, where the discourse about the Troubles is, shall we say, not as sophisticated as it cd be. Go see it and judge for yourself.